1.Inoue, A., Zhang, T., Chen, M.W., Sakurai, T., Saida, J., and Matsushita, M.: RETRACTED—Formation and properties of Zr-based bulk quasicrystalline alloys with high strength and good ductility. J. Mater. Res. 15, 2195–2208 (2000). doi: 10.1557/jmr.2000.0316. 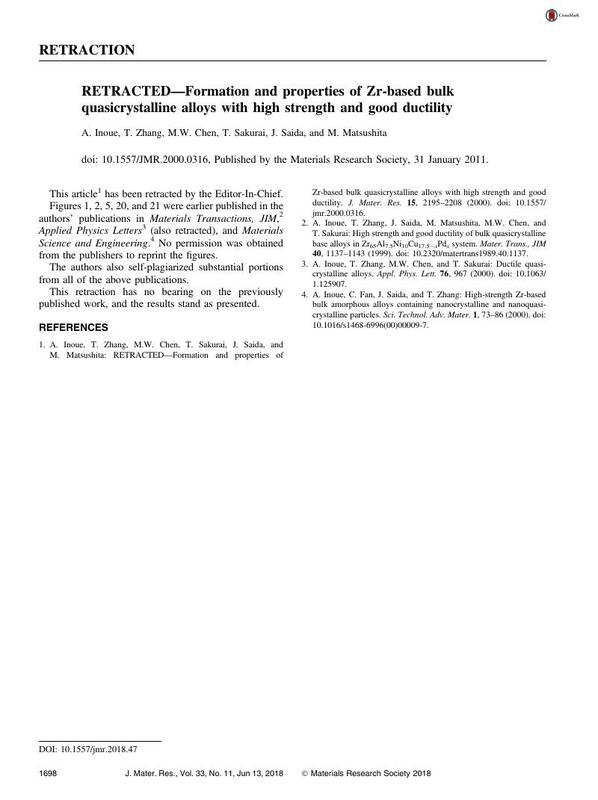 2.Inoue, A., Zhang, T., Saida, J., Matsushita, M., Chen, M.W., and Sakurai, T.: High strength and good ductility of bulk quasicrystalline base alloys in Zr65Al7.5Ni10Cu17.5−xPdx system. Mater. Trans., JIM 40, 1137–1143 (1999). doi: 10.2320/matertrans1989.40.1137. 3.Inoue, A., Zhang, T., Chen, M.W., and Sakurai, T.: Ductile quasicrystalline alloys. Appl. Phys. Lett. 76, 967 (2000). doi: 10.1063/1.125907. 4.Inoue, A., Fan, C., Saida, J., and Zhang, T.: High-strength Zr-based bulk amorphous alloys containing nanocrystalline and nanoquasicrystalline particles. Sci. Technol. Adv. Mater. 1, 73–86 (2000). doi: 10.1016/s1468-6996(00)00009-7.